(NewsUSA) - Some brides-to-be might find it hard to think beyond the intense planning that a wedding requires. But beyond the pomp and circumstance of the big day, it's important to think ahead to mergers -- not the corporate kind, but the merging of styles and décor to set up a home the bride and groom will both love. But if a bride-to-be can't live with her fiancé's 1970s thrift store coffee table and orange bean bag chair, chances are he won't be thrilled with her antique oak hope chest and ornately carved sleigh bed. Can these two conflicting schemes co-exist after the couple has crossed the threshold? Designer Home collections make it easier than ever to meld female and male sensibilities in home décor by offering products to suit a variety of styles. Bedding, furniture, fabrics, area rugs, flooring, storage accessories, table linens and window coverings are all designed to work in traditional and more updated settings. Here, florals and neutrals work remarkably well together, and tactile fabrics add depth, style and colorful nuance. No matter which room is the newlyweds' favorite, bedrooms, baths and living rooms all can be decked out in style. For the latest in designer styles for the home, couples can check out the Liz Claiborne Home collection on www.jcpenney.com and www.qvc.com. *	Setting the tone. Choose a color scheme together, and creatively arrange furniture and accessories around it. 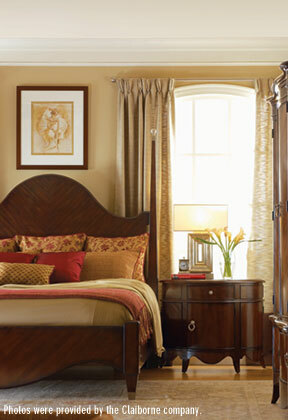 Find a neutral ground to meld his love of earth tones, for example, with her love of soft fabrics. A mélange of colors and fabrics -- on everything from comforters to window valances -- will inspire looks ideal for both Mr. and Mrs.
*	Splish, splash. Create an understated, clean look in the bath for him, but add accessories with a dash of color to satisfy a bride-to-be's lively outlook. Bold shower curtains, wastebaskets and vanity items inject freshness and personality. *	Boudoir basics. Usher in a new home with a fresh set of bedding; couples can look for a variety of styles and colors designed to be dressed up or left as is for a classic look. Decorative pillows, shams, coverlets and throws complete the look and are a great way for wedding guests to add to the couple's cozy love nest. *	Staples of style. If he loves a more modern style, but she wants a retro feel, furniture options in leather, fine fabrics, hardwood and wicker can readily mesh both personalities. *	Merging moods. She's a homebody; he likes beaches and picnics. For bedrooms and living rooms, couples can combine sensibilities with bedding and furniture lines that bring the outside in, and vice versa. Try mixing a table from one line with a chair from another -- mixing it up is a playful way to punch up the personality of a room. Just like in the corporate world, mergers can either run smoothly or be a headache. By considering the sensibilities the bride and groom share -- rather than just the differences -- creating a first home together can be one merger full of fringe benefits. Creating a comfortable home with your new spouse may require some compromise.